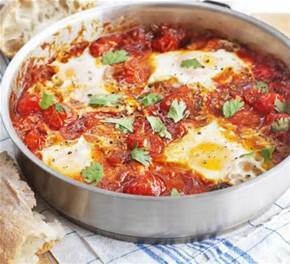 The gorgeous rich, paprika-red mixture of slowly cooked red peppers, tomatoes, onion, courgettes goes perfectly with the runny yolks of the eggs. Try the recipe this week. Heat the oil in a large frying pan then add the onion and fry until golden. Add the garlic, peppers, courgette and tomatoes and simmer for 15 minutes, stirring occasionally, until all the vegetables are soft. Stir in the parsley, paprika and chilli flakes and add a good dash of salt and pepper. Simmer for another 5 minutes. Heat the oven to 160'C or Gas mark 3. Spoon the vegetable mixture into a large ovenproof dish. Make four holes, spaced equally apart, in the mixture and carefully break and egg into each one. Bake in the oven for 10 minutes until the egg whites are just set and the yolks are still runny, then tuck in and eat with crusty bread.